Trump talks about himself, complains about media at first official event. His visit to the CIA was supposed to reassure the intelligence community. Boy did that backfire. President Donald Trump speaks at the CIA headquarters on Saturday in Langley, Virginia. 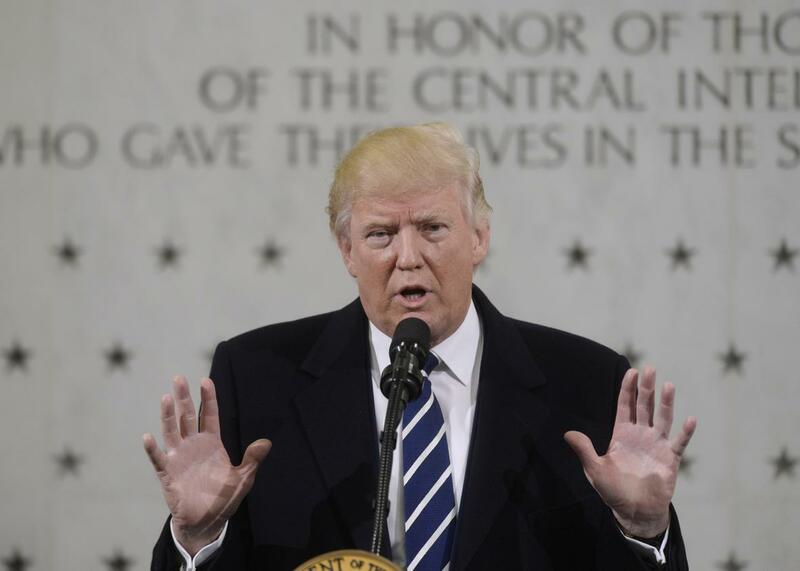 If you believe President Donald Trump’s rampant narcissism might have hit its peak, take a look at the speech he gave Saturday afternoon before the memorial wall at CIA headquarters in Virginia. He made the visit to Langley the first nonceremonial event of his presidency, presumably to assure the intelligence community that—despite the insulting tweets he’s hurled their way, most recently likening them to Nazis—he supports the work that they’re doing and will listen to what they have to say. He also said things that must have baffled many of the 300 CIA employees who gathered for the visit, came in on a day off to see their new boss. He repeated the line, which he’d uttered many times during the campaign, that we should have “taken the oil” in Iraq (a notion that is politically daft, economically unnecessary, and militarily all-but-impossible) and that maybe we’ll have the opportunity to do so now. He also said that he suspected most of the people in the room voted for him in the election—a comment that, whether true or not, is appallingly inappropriate to make to intelligence analysts, who pride themselves on their independence and fear political encroachment above all else. Those in the intelligence community were already anxious about their relationship with Trump before he took office thanks to his reaction to the report on Russian interference in the election, as well as his appointment of Michael Flynn, a conspiracy-minded retired general who is bitter about being fired as director of the Defense Intelligence Agency in 2014. If Trump or his staff thought this speech would allay that distrust and suspicion, they are even more deluded than they sometimes seem.